Full disclosure: I haven’t actually played No Man’s Sky. This is not a review. But I’ve played enough games – especially open world games – and read and viewed enough of the gameplay to put forward an opinion. Positive and negative reviews for a controversial game that isn’t easy to pigeonhole. But the backlash is, as they say, real. Some disgruntled gamers have requested refunds from Sony and Valve. No Man’s Sky stands as an amazing technical achievement, with 18 quintillion randomly generated worlds to explore. The scale, and the algorithms needed to pull this off, are impressive. The DNA of space exploration games like Elite, Captain Blood, and Mercenary lives on here. But No Man’s Sky also represents the logical endpoint of modern gaming – the ultimate in slickly designed, super-massive explore-’em-ups, with core gameplay padded out by inventorying and grinding. I didn’t buy No Man’s Sky for a simple reason: the game seemed spread thin. No matter how sophisticated the algorithms used, these 18 quintillion planets could only ever be variations on a theme. Technically, each planet differs completely from another – varying atmospheres, weather systems, landscapes, and wildlife. But the seams are showing. Textures and color palettes and character designs are being switched out, combinations made to create the illusion of an infinite universe. And so the game’s lack of variety has been the sticking point for many buyers. The planets weren’t varied enough, they argue; No Man’s Sky was not the awe-inspiring experience promised. But was there the same demand for refunds after Destiny – a huge but often shallow, repetitive shooter? What about the static, rinse-and-repeat gameplay of the Assassin’s Creed series, or even Fallout 4? We’re not seeing anything new at the 50 hour mark in those games either. Asking for your money back at this point feels disingenuous. Did it really take No Man’s Sky players up to 50 hours to figure out they weren’t enjoying the thing? The claim has been: “false advertising”. And there’s no question No Man’s Sky misses features that were promised, such as an online multiplayer mode. But this is another embarrassing example of some gamers’ sense of entitlement. You could point to any number of games that were also cut before launch. Remember the interminable sailing and Triforce hunt in The Legend of Zelda: The Wind Waker? Years later the developers confirmed that dungeons had been removed (and recycled into later Zelda titles). Could I have asked for a refund from Nintendo, since The Wind Waker was “incomplete”? Where do you draw the line? 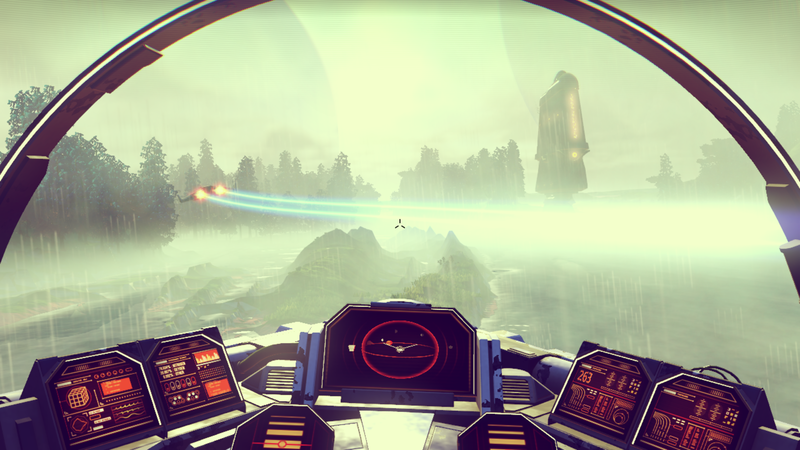 No Man’s Sky: the culmination of “bigger but not better” design. And yet No Man’s Sky players wonder why this game doesn’t feel like a landmark event. There’s a gap here between expectation and reality. 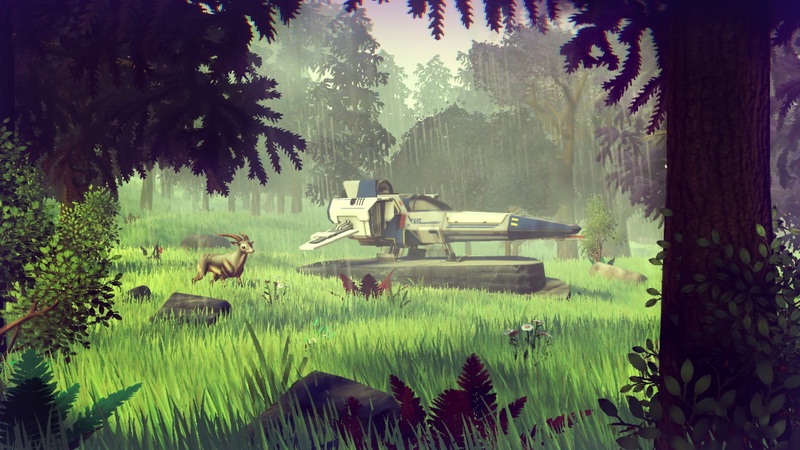 Don’t blame the developers – No Man’s Sky represents a great, if flawed, achievement. Let’s not forget this is still an indie game by a small British studio. I hope the game is successful enough that Hello Games goes onto even better things. The hype ran away from Hello Games, and I have to believe they feel a bit stunned by the overhype, the hysterical backlash caused by last minute delays, and now the refund controversy. But, as the saying goes: give the people what they want. And No Man’s Sky gives us what Assassin’s Creed and Grand Theft Auto and Fallout and Destiny have given us, only on an interstellar scale. We keep buying the same games, mining and looting and crafting and constantly grinding, demanding even larger game worlds – and yet expecting the experience to somehow be different every time. No Man’s Sky should not have surprised anyone. What did we expect from this game? That each of the 18 quintillion worlds would be truly unique? If gamers don’t actually enjoy these types of games, then we need to stop hyping and buying them. Otherwise we’ll keep getting what we want, and keep being disappointed. Share your comments below! 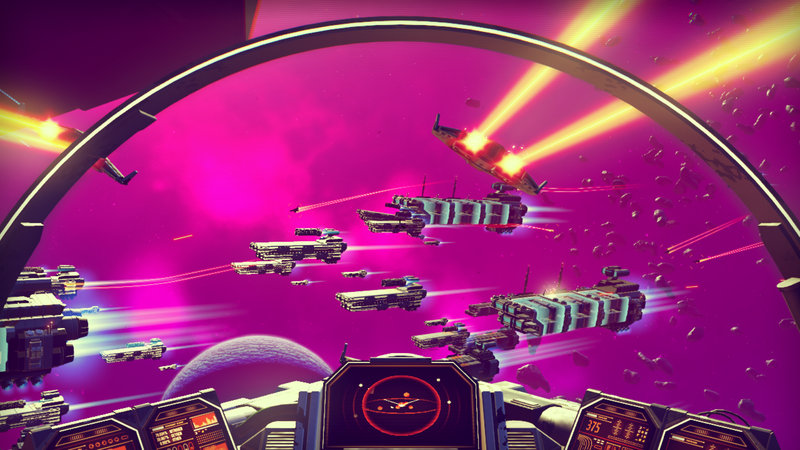 Do you think players are justified in requesting refunds for No Man’s Sky? Projecting is a good word! I think people’s expectations and hopes got a bit out of hand with this one. I do understand the backlash to some degree, as I feel the developers are partially responsible for some of the overblown expectations. However, people also ended up getting too caught up in the idea of a nearly endless universe. With current technology, such a concept can only be implemented in a somewhat limited way, but it seems most were not aware of such limitations. The idea of this quote-unquote “infinite” universe was something that led many gamers to believe each planet would be like going into a new episode of Star Trek. But as you say, with the technology and algorithms used, there’s going to be limitations. But Nick, they lied! They lied! (Sorry, I haven’t really been following the game closely enough to understand what the developers are supposed to have lied about. As you say, features often get cut, or these days more often are delayed to be patched or sold as DLC. Wind Waker is a good example of a game having content. I guess the only saving grace there is that Nintendo didn’t actively announce in advance how many dungeons there would be. Still, it’s obvious that anything promised pre-release is not 100% guaranteed and it’s always risky in this day and age buying a game blindly for full price on day one. Great point about there being nothing guaranteed. I never really understood the pre-ordering, or buying a game on day one either. With the amount of expectation and hype for No Man’s Sky, it just seemed it would inevitably disappoint. I didn’t actually know too much about No Man’s Sky before it came out. I haven’t played the game either, but I can see why people don’t like it. I don’t think it necessarily means that it’s not great or that nobody likes it, but it’s a shame that it’s being treated like a disappointment because of the expectation surrounding it. It feels similar to the Mighty No. 9 situation except that game was crowdfunded by a well-known developer and this is a $60 Sony-promoted indie game. Different situations with similar disappointments from gamers. Maybe gamers have higher expectations for some of these games than they should. Agreed. It’s still an indie game, albeit it one with major support from Sony, and I also feel a bit disappointed for the developers that they are receiving this level of criticism. I’ve not played it yet, but it strikes me as a game where there’s quite a lot of mindless grinding. But it seems like more of a serene experience than anything else, which certainly piques my interest. Innit, yo yo yo. I can’t deny that floating around in space does have a zen-like appeal to it. But it’s the grinding and crafting thing that I think I’d get frustrated with. I think part of the problem is that in reality this was an ambitious indie game made by a small studio that was massively hyped up by Sony (and Sean Murray has to share much of the blame too) and the echo chamber that is the mainstream media as a game that would change everything and be all things to all people. And it didn’t help that it was marketed and priced as a triple A game. The irony being that many other “disappointing” games have been hyped in a similar manner, but it seems that as a community, we never learn from the past. We need to keep our expectations in check and be more critical of the hype machine. But, perhaps most importantly, we need to stop the idiocy that is pre-ordering, which benefits only publishers. I totally hear you. As you say, so many other games have been hyped and have disappointed. We don’t learn. And the hype machine is pretty much out of control – it’s almost driven now by the fans who will turn on a game as soon as it fails to meet their outsize expectations. Short answer, no. I don’t think players should request their money back because the game wasn’t what it was *hyped* to be. While I am a fan of the internet and the game community, I think we as a whole sometimes get a little too “stuck” on what could be and what might be, and then don’t see what’s actually sitting in front of us. I haven’t gotten the game yet (it’s on my ever-increasing list… sigh), but the gameplay footage I’ve seen is breathtaking. It seems like a game that you jump in and out of when you want to assault your senses with beautiful landscapes, not one that you sit down an play through until you “beat the game.” Like with so much else, I blame the hype-trains, which blind us to reality and what is actually reasonable to expect from a game. I still plan on playing around with this one, flaws and all. Hi Athena – thanks for your thoughts! I agree with you that the hype has taken us away from what is “reasonable”. Gamers can often commit themselves to new games before anyone has had a chance to play or review them – leading to more and more disappointment.